Not all chess pawns are good. It depends if they are protected or isolated, doubled or weak. If you have disrupted pawn islands all over the board, they are hard to protect and you may lose a pawn or more and the game. Connected Pawns are good pawns because they can protect each other. Double Pawns cannot protect each other and stand in each others way. A disadvantage for you if your position has any. Isolated Pawns are bad pawns because they have no neighbour pawns. If they get attacked your pieces must protect them. This binds energy and therefore this pawn structure is bad for you. Tripled Pawns cannot protect each other and stand in each others way like double pawns. They are worse than double pawns. A disadvantage for you. 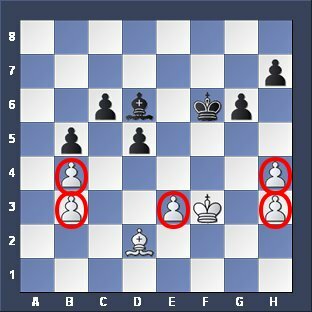 The Passed Pawn at c6 is near the promotion square c8. A very dangerous pawn because no opponent pawn can stop him. The Backward Pawn c7 has lost its connection to his neighbours. It is very weak similar as an isolated pawn. It usually gets attacked by pieces and has to be protected by pieces. "...good play of the pawns; they are the soul of chess: it is they alone that determine the attack and the defence, and the winning or losing of the game depends entirely on their good or bad arrangement..."
Chess Pawns are the soul of the game and it is vital to move them correctly and avoid bad pawn structures. 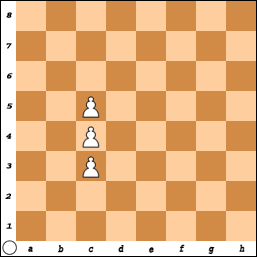 If you have moved a pawn then this move cannot be reversed. So take care that you do not inflict damage to your position. In chess there are various pawn structures that are very weak. 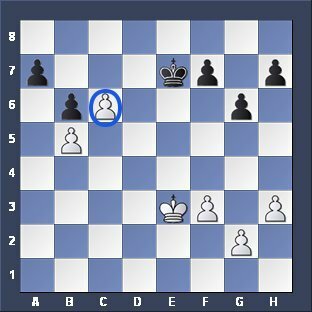 If you have such a bad pawn formation then try to get rid of it, if you can. 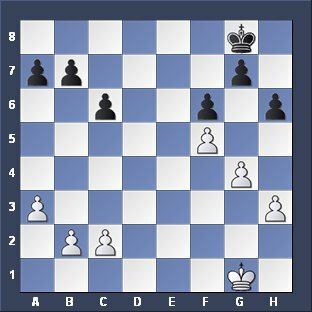 Exchange weak isolated pawns or change the structure completely or partly, if possible at all, in your chess game. But you have to do that early in the game, not when it's too late. In the following positions the damage has been done already as the formation can't be changed anymore. In chess once a pawn has moved forward, it cannot return. That means once you have ruined your structure with senseless pawn moves, the damage can't be undone. You may have weakened some squares forever. 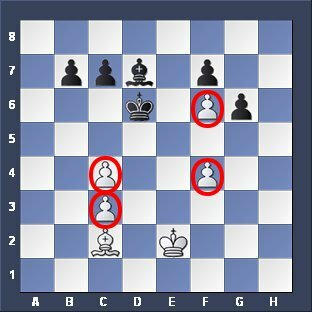 So be careful and think about the consequences that such a pawn move may have on the structure before you move it. The pawns can protect each other. This is a good structure. DOUBLE pawns on the c-File and f-File. They can't protect each other. They obstruct each other. A disadvantage for white. 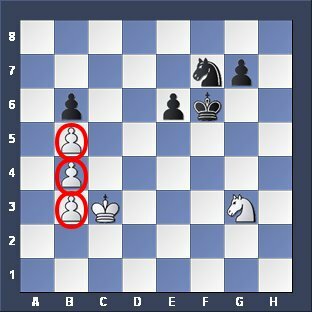 DOUBLE pawns on b-File and h-File and an ISOLATED pawn on e3! This white structure is a nightmare. The pawns are weak and can't protect each other. Do you see that? 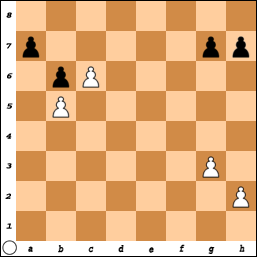 Very bad structure for White. The value of the TRIPLE pawns is almost the same like the value of the single pawn on b6 from Black. 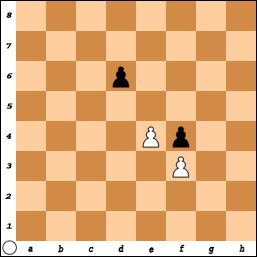 Black has two passed pawns on the kingside to make a Queen when they reach the first rank. 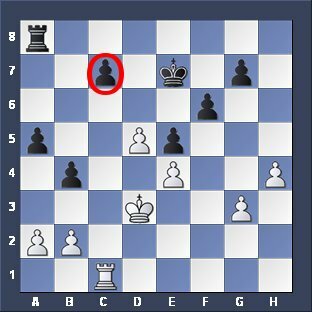 A strong pawn on c6. No black one can stop him reaching the eight rank. This one is dangerous, yes. White can be happy. The pawn on c7 has lost the connection to his neighbours. It is weak as he cannot be protected by others.